This nail polish stayed on without chipping all night! I bartend at a restaurant, it’s almost impossible to wear nail polish to work without my nails looking ratty by the end of the night. I rarely wear polish to work because we have to have clean looking nails and heaven forbid polish chips being found in someone’s drink or food, but I couldn’t resist. 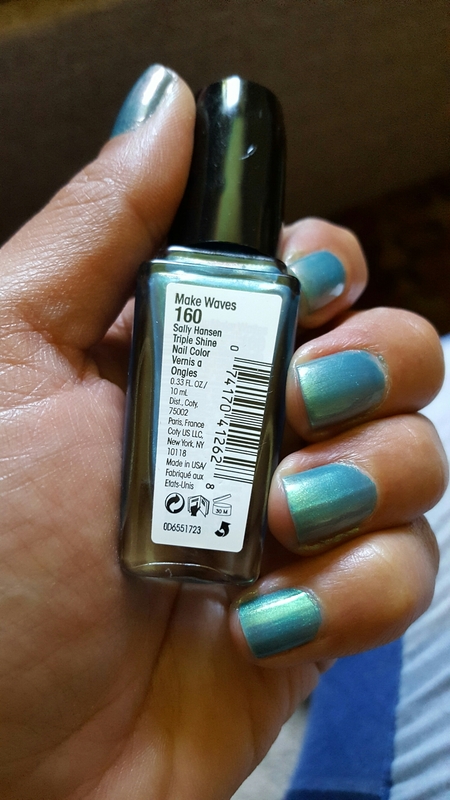 I used Sally Hansen Triple Shine in the color Make Waves. It applies sheer, I used 3 coats with no base or top coat. I miss painting my nails more often. I subscribe to Julep’s monthly subscription box, which means I own over 100 polishes from the last few years! I never thought I would own more than 10!